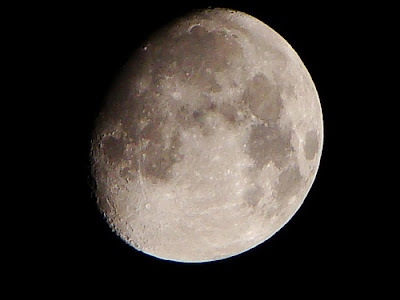 (Inactive) Shrinidhi's Photo Blog: Moon- Close up-who needs a telescope? Moon- Close up-who needs a telescope? Camera: Sony DSC H50: 15x optical zoom + 81x digital zoom was used to get this close. Used Prashant's tripod for steadiness. A higher altitude (2400 meters) and a clear sky free from pollution, clouds or rain made this easy. Excellent photo of Chandamama. I am doing a post on Chandrayaan-I and surely this post deserves a link. Use VGA Mode, exposure Auto. Use tripod for stability. Rest of the setting you can try and experiment. If you're having problem I can be more specific.